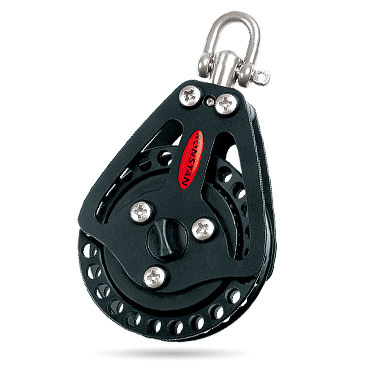 The patented extruded hole design, in conjunction with the groove profile of the sheave, provides a more powerful grip than conventional designs - up to 14:1 holding power. Unrivalled low weight is achieved by the use of a Torlon® ratchet pawl, high grade machined alloy sheave and black Acetal hubs and bearings. On-Off switching knob is fitted to both sides of the swivel blocks (one can be removed if desired) Unique On-Off switch mechanism can be operated under load. Ratchet blocks can be disassembled for servicing or customisation. Exceptional holding power, enabling spinnaker sheet trimmer to gybe without using winches in controlled conditions.